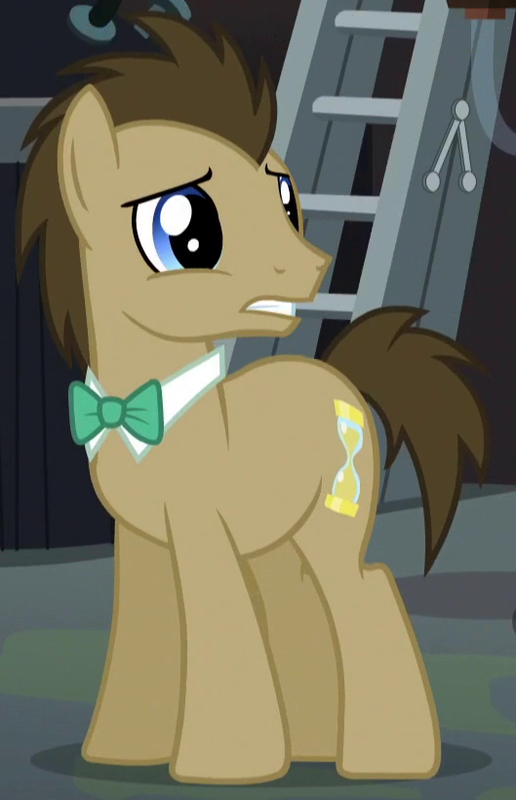 Dr. Hooves: Going back in time is old thinking, my friend. I was working off a cutting-edge theory of making time come forward to you. My life's work, decades – centuries, really – of research and experimentation, and I nearly had it cracked! Turns out there's a magic spell for it. Who knew? Absolute, true, and mathematical time, of itself, and from its own nature flows equably without regard to anything external, and by another name is called duration: relative, apparent, and common time, is some sensible and external (whether accurate or unequable) measure of duration by the means of motion, which is commonly used instead of true time; such as an hour, a day, a month, a year. It seems that there is a Chronology Protection Agency which prevents the ppearance of closed timelike curves and so makes the universe safe for historians. I was working off a cutting-edge theory of making time come forward to you. My life's work, decades – centuries, really – of research and experimentation, and I nearly had it cracked! Turns out there's a magic spell for it. Who knew?